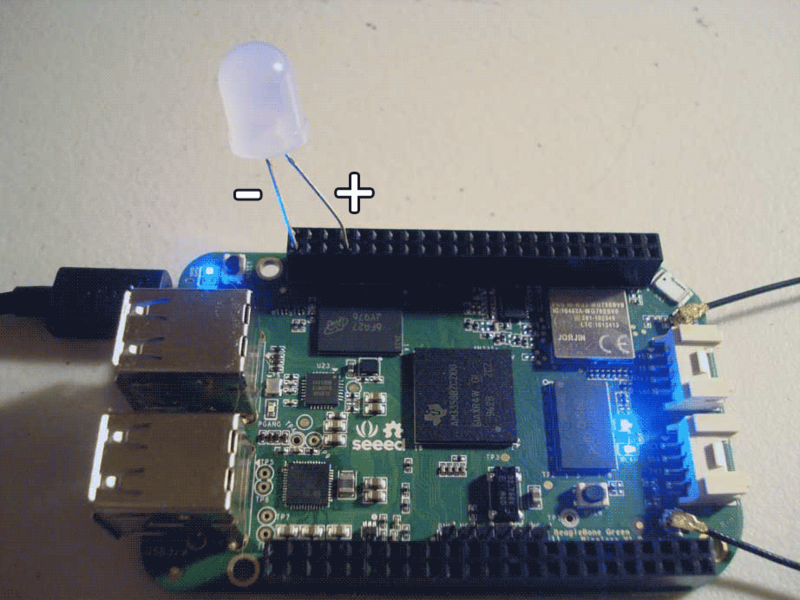 In this short tutorial, you will learn how to setup the BeagleBone Green Wireless (BBGW) for Bluetooth use and create a simple Python script that will trigger an LED to light up when a known Bluetooth-capable device (such as your phone or fitness band) comes within sensing range. This demo should be used as a simple starting place for creating systems that require the ability to track or sense known users by their handheld Bluetooth devices. Some Linux command line experience. Make sure you are running the latest firmware image for the device. Be sure to use only the images named bone-debian-8.4-seeed-iot-armhf-2016-MM-DD-4gb.img.xz from the seeed-iot directories. As the platform matures the most up-to-date image will be moved to the official wiki page but for now use the latest testing build. For more information about updating the BeagleBone Green firmware or flashing the eMMC to free up a microSD card, check out the official page on the matter here. Now it is time to install the Bluetooth library prerequisites required by pybluez. Finally use the Python package manager to install our Bluetooth framework. With all the libraries and dependencies installed it is now time to finally start up our Bluetooth chipset on the BBGW. This is a little built-in script for wireless-capable BeagleBone models that discovers Bluetooth hardware and sets it up for use. To keep this demo as simple as possible, I've elected to just have the script toggle a single LED connected to pin P8_7. Since the current draw of most LEDs is pretty small, we can directly drive it from a GPIO pin on the BeagleBone without issue. If you want to be completely proper, add a 200Ω or so resistor in series with the LED to limit the current draw. Head down to the schematic section for an image of how to insert the LED. In general, what we want is a simple loop that requests information from a known Bluetooth device ID and, depending on what it hears back, changes the state of a digital output pin accordingly. If the script receives the requested information, we set a pin connected to an LED to HIGH, otherwise set it LOW since the device must now be out of range. The neat thing about polling for public Bluetooth information, we no longer have to worry about pairing with the desired device! This greatly reduces the complexity of the system down to something that can be implemented in just a few lines of code. To make the script a bit easier to use, I've added some helpful user prompts and a device discovery stage to make identifying your Bluetooth device easier. After following the onscreen instructions, the script will then proceed to ping your device for information every few seconds. Try walking away from the BeagleBone and walking back to see what the detection range is for your specific device. The LED, despite being tradition for intro tutorials, makes it pretty easy to tell what the current detection state is from a distance. A typical usecase for this detection method with the user traveling in and out of the detection range. For my phone, I had to get around 12 feet away before the BeagleBone lost connection and when coming back into range, there were a few false negatives. The script above is just meant as a quick working example of a detection method that doesn't require device pairing. I'll leave the reader with some ideas on how it can be expanded for use in a more serious system. Use the more advanced features of the pybluez library to get signal strength (RSSI) information to measure device distance. To keep this demo as simple as possible, I've elected to just have the script toggle a single LED connected to pin P8_7. Since the current draw of most LEDs is pretty small, we can directly drive it from a GPIO pin on the BeagleBone without issue. Though if you wanted to be completely proper, add a 200Ω or so resistor in series with the LED to limit the current draw. After following the onscreen instructions, the script will then proceed to ping your device every few seconds. Try walking away from the BeagleBone and walking back to see what the detection range is for your specific device. # Try to gather information from the desired device. # to reduce false negatives.